I’m in St. Louis right now to help with moving my mom to Boise. We hired some good folks from Labor Ready today to come help clean out the house, and as a result found ourselves ahead of schedule this afternoon. So we took time to catch a movie (saw Get Smart – good fun there) and head out to a St. Louis icon. That’s right. 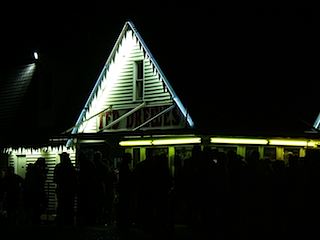 Tonight we went to Ted Drewes. 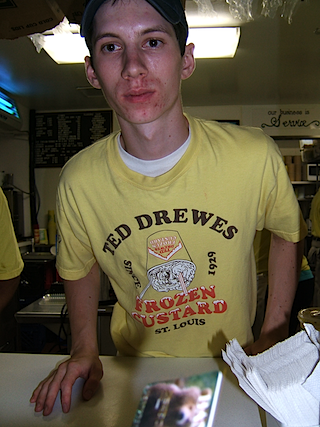 Every time I get to St. Louis for just about anything, I try hard to find time to head on down to Ted Drewes – it really is a landmark here – and for good reason. 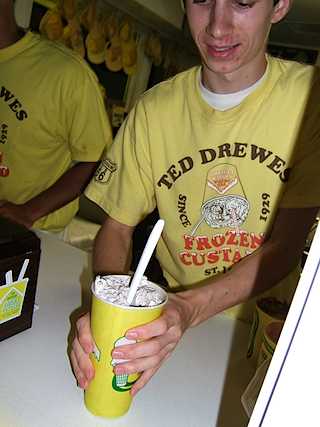 You see, Ted Drewes serves frozen custard. 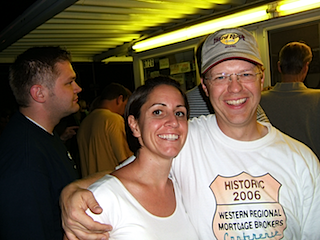 Now, this is not just any frozen custard – I think it’s just about the best frozen anything in the world. I mean, sure the north and south poles are pretty spiffy frozen stuff. I’ve met a few mountains in both Colorado and Utah that my skiis thought were pretty fantastic when frozen. 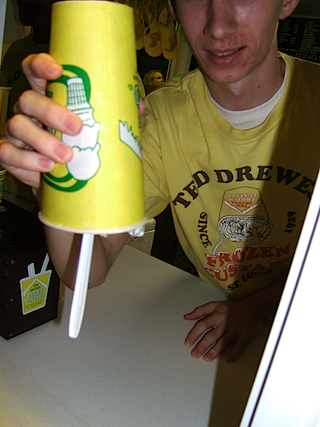 Heck, I really enjoy some good old frozen water when it keeps my drink cold – but nothing compares to the sweet, silky smooth frozen treat that is a Ted Drewes Concrete. They call it a concrete because it really is thick stuff – so thick, in fact, that they serve it upside down. Want proof? Scroll down. Tonight there must have been a Cardinals game – because the lines were out to the street and the police were there directing traffic around all the people. I waited in line with my brothers and sister in law, sidled on up to the window and hollared “I’d like a medium Reeses and Oreo, please!”. The guy nodded and turned around to hollar my order back to the blessed ones who get to actually make up all the orders. I’d get so fat if I was one of them. I actually heard the angels singing. 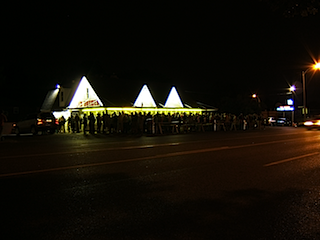 So, next time you head to St. Louis, give it a try – it’s on the famous Route 66, and really is a fantastic way to cool off on a hot summer St. Louis evening.